Aaron Weinstein is not letting his illness keep him from going to school, and sharing laughs with his classmates. Last year, Aaron, a first grader at Allen W. Roberts Elementary school in New Providence, was diagnosed with leukemia. Thanks to a new robotic device called Vgo, in the past two months he has been able to participate in class from home. 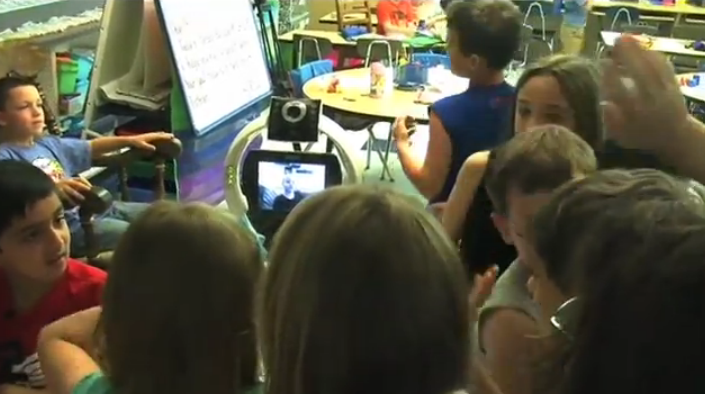 Vgo is a four foot tall robot with a wireless video hookup, allowing the student to remotely experience school. “So it's an iPad on a big stalk, with a big circle on the top. The circle is white and it has wheels on the bottom,” Aaron says. He answers questions by making the robot flash instead of raising his hand, and talks with the teacher. The device is not just stationary, it is also able to look down and up, allowing Aaron to see everything that's going on in the classroom. “The computer connects to the iPad, and my face is on the computer. The little box in the corner so I can see myself, so I know what I'm doing, I get the style I want, stuff like that,” Aaron says. The Valerie Fund Children's Center and the Morristown Medical Center loan him the robot. “The goal is to make sure we have robots for every child that's going to be out of school or away from their friends for an extended period. If it takes 10 robots to make that happen, that's great. If it takes 50 robots to make this happen, we'll try and find a way. The Valerie Fund is committed to making sure that these children that are fighting cancer and blood disorders get everything they need to live normal healthy lives,” said Barry Kirschner, Valerie Fund executive director. “He hadn't seen any of his school friends in three, four months. And it was a good way for him to just be sort of present and to connect with them again,” said Weinstein. Michele Picarelli, Aaron's teacher, said the robot is not only helping Aaron be part of the class, but it also helps his classmates feel better about him being homebound. “They've been phenomenal. They'll scream 'Aaron's coming on! Aaron's coming on!' in case I'm not physically looking at the Vgo I have 22 sets of, you know, they're usually telling me. It's been great,” she says. The device assures Aaron's friends that he is alright. “He can still communicate by using the Vgo, cuz it's really good at making Aaron able to hear what we're saying and see what we're doing. It's really good at making us able to hear what he's saying and see what's he's doing,” said Olivia Mangel, Aaron's classmate. “He's smart, he's nice, a good friend,” said Trevor Fornuff, Aaron's classmate. “I remember the first day Aaron wanted to leave the classroom and go to gym. The day he went to gym and was out in the hallway, that was maybe the second day that we had the Vgo in the building. All of a sudden, the fifth graders, the sixth graders, they were so excited to see the robot in the halls. He was already a celebrity,” said Gina Hansen, school principal.